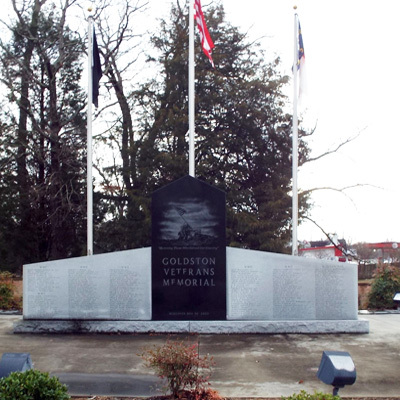 The Goldston Veterans Memorial consists of a multiple elements. The focal point is a black granite gable top tablestone with a laser etching of the World War II flag rising over Iwo Jima. Attached to either side are gray granite tablestone pieces that angle up to the midpoint of the center stone. The fronts of these side stones have three columns of veterans' names from World War I, World War II and Korea. The rear has veterans’ names from Korea, Vietnam, Gulf War, Iraq and Peace Time. The rear of the center stone has the Great Seal of the United States etched near the top and then the coats of arms for the five branches of the military forming a V beneath. To accommodate additional names, separate granite gable top tablestones have also been placed to either side of the main memorial element. The memorial stands on a large concrete courtyard. Along the courtyard’s rear edge are several rows of black granite memorial stones. Along the front edge are four granite memorial benches. A single sidewalk leads from the parking area to the memorial. On the left, at the sidewalk’s intersection with the courtyard, is a granite lectern style marker with a bronze plaque containing “The American Creed.” Three flag poles, lighting and scattered scrubs complete the memorial area. Rear: LET US NOT FORGET / TO HONOR THOSE / WHO HAVE SACRIFICED / SO MUCH FOR OUR / FREEDOM. Bench inscriptions, four total: KILLED IN ACTION / DEDICATED TO ALL THE COURAGEOUS MEN AND WOMEN WHO / MADE THE ULTIMATE SACRIFICE IN DEFENCE OF THEIR COUNTY, / BY HONORING THOSE WHO HAVE SACRIFICED THEIR LIVES TO PROTECT / OUR FREEDOM, WE INSURE THAT THEIR HEROIC SPIRIT WILL LIVE ON. / ALL GAVE SOME… / SOME GAVE ALL. IN HONOR OF ALL VETERANS FOR THEIR / SACRIFICES TO KEEP OUR NATION FREE / BY CHATHAM MONUMENT CO. 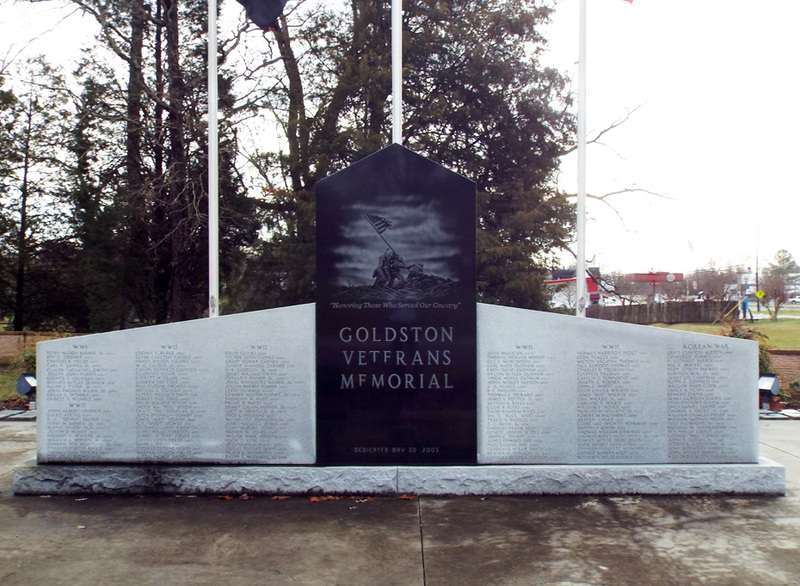 The memorial is located at the corner of Pittsboro Goldston Road and N. Main Street in Goldston, NC. The park like setting connects to the parking lot for the Goldston Public Library at 9235 Pittsboro Goldston Rd. The memorial complex is surrounded by shady trees and seasonal greenery.